Assignment How has Muhammad Ali's life and boxing career affected (and been affected by) social developments in the Western world? Background Muhammad Ali (Cassius Marcellus Clay) was born 17 January 1942 in Louisville, Kentucky to parents of modest circumstances. He started boxing in junior high, when he learned boxing from a policeman at a local gym. By the time that Ali had reached high school, he already intended to be a prizefighter and hoped to box in the Olympics. As an amateur boxer, Ali attracted notice in 1960 by winning the Amateur Athletic Union light heavyweight and Golden Gloves heavyweight championships. At the Rome Olympics in 1960, Ali crushed his opponents to win a gold medal in the light heavyweight division. After turning pro, Ali defeated his first opponents. Then on 25 February 1964, he fought, and knocked out, Sonny Liston in seven rounds, thus becoming the new heavyweight world champion. Ali defended his title nine times from 1965 to 1967 and became universally recognized as world heavyweight champion after outpointing World Boxing Association (WBA) champion Ernie Terrell in fifteen rounds on 6 February 1967. Ali often proclaimed his invincibility in verse and boasted, "I am the greatest!" 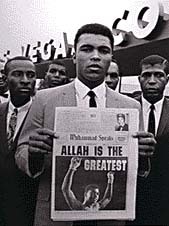 Soon after becoming heavyweight champion, Ali decided to change his religion and joined the Nation of Islam (Black Muslims), taking the Muslim name "Muhammad Ali." The Vietnam War then interrupted Ali's career. In 1967, he was inducted into the military, but he refused to serve, saying his religious beliefs forbade him to fight. While some Americans praised Ali for risking prison to stand up for his beliefs, others called him a draft dodger and traitor. The government charged him with violating the Selective Service Act; his titles were taken from him; and he was not allowed to box. After a long court battle, Ali was convicted of draft evasion and sentenced to five years in jail and fined $10,000 fine, but in another lawsuit in 1970, a judge ruled that Ali could still box professionally. The new heavyweight champion was Joe Frazier, and a match was scheduled et for 8 March 1971. Newspapers called it "The Fight of the Century." In the fifteenth round, Frazier knocked Ali down. Ali got back up, but all the judges named Frazier the winner. That same year, Ali won his legal battle when the U.S. Supreme Court said he was not guilty of draft evasion--He should not have been drafted at all. Ali spent the next three years fighting other champions, including Jerry Quarry, Floyd Patterson (making a brief comeback attempt), Joe Bugner and Ken Norton, winning all but one fight to Ken Norton. He also won a unanimous decision over Frazier on 28 January 1974, but Frazier had lost the heavyweight title to George Foreman. So Ali next had to fight Foreman. Millions of people sat before their televisions to watch the fight between Ali and Foreman, staged as "The Rumble in the Jungle." Sixty thousand fans gathered at the stadium in Kinshasa in Zaire on 30 October 1974. People favored Foreman, who was seven years younger than the 32-year-old Ali, but Ali fought brilliantly, tiring his opponent using "rope-a-dope" tactics. In round eight, Ali knocked out Foreman. He could still "float like a butterfly and sting like a bee," as he liked to say. Ali had regained the undisputed world heavyweight title. After defending his heavyweight title six times--including a third fight with Joe Frazier--Ali lost it to Leon Spinks on 15 February 1978 in a split decision. He regained the WBA title from Spinks seven months later in a unanimous decision, becoming the first boxer to win the heavyweight championship three times. In 1979 Ali announced his retirement, at that point having lost only three times in 59 fights, but he returned to fight World Boxing Council champion Larry Holmes in 1980 and Trevor Berbick of Canada in 1981, losing both. Ali then retired permanently. As Ali entered his forties, he looked ill. In 1984 it was assumed that he was suffering from a series of symptoms variously known as "punch drunk" syndrome, or chronic encephalopathy of boxers, but Ali had Parkinson's disease, an illness of the nervous system for which he was taking medication. "I feel fine," he insisted. "I'm older and fatter, but we all change." Ali was selected to light the Olympic flame at the 1996 summer games in Atlanta, Georgia. Timeline 17 January 1942, Cassius Clay (Muhammad Ali) born in Louisville, Kentucky. 1960, won light-heavyweight gold medal at the Rome Olympics. 25 February 1964, fought, and knocked out Sonny Liston; became heavyweight champion. 1964, joined Nation of Islam. 1967, inducted into the military but refused to serve. 8 March 1971, Ali lost to Joe Frazier. Supreme Court ruled in favor of Ali. 28 January 1974, Ali won unanimous decision over Frazier. 30 October 1974, Ali knocked out George Forman in the "Rumble in the Jungle." 15 February 1978, Ali lost the heavyweight title in a split decision to Leon Spinks. Ali regained the title from Spinks seven months later. 1979, Ali retired. 1980, Ali lost a comeback bout to Larry Holmes. 1981, Ali lost a comeback bout to Trevor Berbick. 1996, Ali lit the Olympic flame in Atlanta. WWW sites I Am the Greatest! is the Smithsonian exhibit of Muhammad Ali's gloves and robe with further links. A detailed description of the life and times of Muhammad Ali exists, as does a short overview/timeline history of his career. A biography of Ali is available from the International Boxing Hall of Fame. Good sites dedicated to the boxer are maintained by the Louisville Courier-Journal, the author of a book about Ali (with his ring record) and a celebrity reference organization, the Muhammad Ali site, which contains information about the boxer. Webgalleria offers an extensive collection (books, photos, lithographs, etc. ), some of which is of Muhammad Ali and other boxing merchandise for sale. The site also has a biography of Ali. Finally, the When We Were Kings (from the documentary of the Ali-Forman fight) home page also has valuable information about Ali. Recommended Books There are a number of biographies of Ali: Timothy Dailey, Muhammad Ali: The Greatest of All Time (1999); Thomas Hauser, Muhammad Ali: His Life and Times (1991); Larry Bortstein, ed., Ali (1977). A good memoir is by Ali's doctor, Ferdie Pacheco, Muhammad Ali: A View from the Corner (1992). Elliott Gorn, ed., Muhammad Ali, the People's Champ (1995), is a collection of papers tracing Ali's impact outside of boxing. Finally, two works by Ali himself are recommended: Ali! Ali! : The Words of Muhammed Ali (1979) and Greatest: My Own Story (1976).